If you are in a hurry and just after our personal recommendation for the best water baby carrier to use this summer, we love the Beachfront Baby Wrap. Using a water baby carrier also by some known as “Body Glove Carrier” can be very useful if you want to cool off on a warm summer day with a baby. Although your regular soft structure carrier could be used it will not dry as quick. You don’t want to walk around with a wet baby carrier all day, you also don’t want to wait all day for your carrier to dry out. The best solution is to use a baby carrier design for water use. Since most water baby carriers are made from light and airy fabric, you can also use this if you are living in a tropical or hot and humid place. 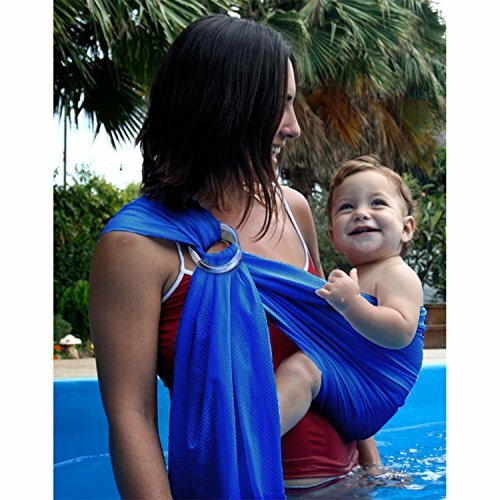 A water baby carrier provides a secure way of carrying your baby while swimming. There’s no chance for your baby to accidentally slide off your arm while you are carrying him/her in the pool, or in the shallows at the beach. We will provide some tips on what features to look out for when selecting your baby carrier, and review some of the best choices available in the market. Water baby carriers are meant to be used in beaches and swimming pools and whether you like it or not, the sun is always going to be there. That is why it is important to use baby carriers that can protect your child against the harmful effects of ultraviolet rays. Keep in mind that a baby’s skin is sensitive and exposure to the elements like the sun can have detrimental effects. A water baby carrier needs to have a fabric that dries quickly. Study the fabric of the carrier before buying it. You don’t want a fabric that is going to be consistently wet even when you and your baby are already out of the water. A quick drying carrier will save you a lot of work and packing as well. You only need one carrier on vacations and travels because you can use the carrier in and out of the water. There’s no need to change carrier just because it doesn’t dry quick enough. This is another key feature of any water baby carrier – it needs to be lightweight. Remember that carrying your baby while both of you are in the water can be challenging and you don’t need any extra weight. Choose fabrics that do not absorb too much water. Non-absorbent fabric allows you to go in and out of the pool with ease. You will be dealing with material that is intended to get wet. When things are wet, they are slippery. Make sure that the fabric does not turn into a slippery slurry equivalent or you may be risking your baby in and around wet areas – which usually involves hard surfaces. The components will also be exposed to sea salt, or chlorine depending on whether you are at the beach or pool. These are things that a standard baby carrier is not designed to be exposed to and the components could be affected by this over time. Cleaning your carrier regularly should negate any deterioration over time, but it is worthwhile paying attention to the condition of the carrier before each use. Remember to keep the posture of your baby in check. Make sure that the back is well supported. Make sure that the chin of your child is always above the water. Younger babies need to be facing you at all times. For older babies, you can carry them facing out but frequent checking and monitoring is required. Avoid backpack carrying in deep waters. You can do these if the water is only above your ankles and below your knees. The Beachfront Baby Wraps are specially designed beach and water use. The light mesh fabric makes this carrier very comfortable for you and the perfect quick dry material for pool or beachside fun. With a recommended weight range of 8lbs to 30lbs, you will find this suitable from just a few weeks old to toddler age. The carrier comes in three sizes, so make sure you match up your t-shirt size with the recommended carrier size at purchase. The beachfront baby carriers are made to carry your child in the optimal position for water conditions, this is very important for the baby’s safety. The carrier is made of a breathable mesh consisting of 100 percent polyester jersey, this is optimal for quick drying once out of the water. Please note that this carrier does not protect your baby from the sun, so you will still need a hat and sunscreen to keep your baby safe from the sun. This carrier is made from 100% mesh polyester fabric that is non-absorbent and quick drying. This makes it another great carrier to use around water. The ring sling style requires a different baby wearing technique and is an easy one to master for those without much experience. There are no wrapping procedures required. You just hook it over your shoulder and your baby will sit in the pouch. It is one of the more affordable water ring sling options, which makes it a very low-risk option. The small carry bag is a neat addition and allows you to fit this snuggly in your handbag on a day out. This water carrier comes with its own bag so you can keep it away neatly when not in use. The Vlokup is simply a baby wrap made from the quick dry mesh material. Using this kind of jersey material will feel very different from your standard wrap. The fabric does not have that stretchy feel to it and will remain quite rigid. As with any wrap, it takes some time to master the technique of tying it off in a safe and well-balanced way. I would encourage you to make sure the material is dry when you try to do this as it can become a bit slippery once it is wet. This should not be a problem if your baby is securely in place when you get into the water, and does give you more control over the positioning of the baby so you can match to their size, weight and the water level you will be splashing around in. With the cloth being over 16 feet (5 meters) long it will accommodate most body types. With a second recommendation for Beachfront Baby you know they are doing something right! This time we have the ring sling style carrier making an appearance in our list. With water use, there is a risk that the ring component could erode over time. 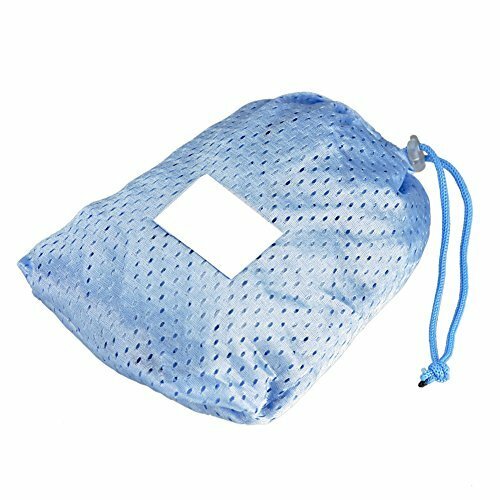 The material used for this specialty water ring sling is made of anodized aluminum. This will make it resistant to corrosion and chlorinated water. The sling is made of quality breathable athletic mesh fabric that is fast drying and again great for water use. The recommended weight range is 8-30lbs, the same as the wrap. Sizes are also scaled in the same way as the wrap with three sizes to choose from; regular, extra-long and petite. So make sure you check the comparable t-shirt size before placing your order. The regular size is 72 inches long (will fit size small, medium or large). Extra long is 90 inches long (will fit size extra large or 2XL). The petite is 66 inches long (will fit extra small or small). For the budget conscious and casual user the Hango will do a reasonable job. The quality does not quite measure up to the Beachfront, but still represents decent value as long as your expectations are realistic. Hango is a German ring sling design and is made from quick dry fabric that is waterproof, light, breathable and fast drying. Make sure to read the instructions for proper wearing of the carrier to ensure your baby’s safety and to avoid any strains on your body. Be sure to spread out the cloth wide across the back to distribute the weight evenly. The carrying capacity is 18 kg and can be used for baby’s age 0-30 months. When around water you do not want to take any chances with your baby. Accidents can happen in the blink of an eye and safety is paramount. Water and smooth baby skin can be a slippery combination, so you can remove a lot of the risk that comes with being around water with one of these specially designed water carriers. They are cost effective, light, and will give you peace of mind knowing your little one is secure. Plus most models store well and dry easily. 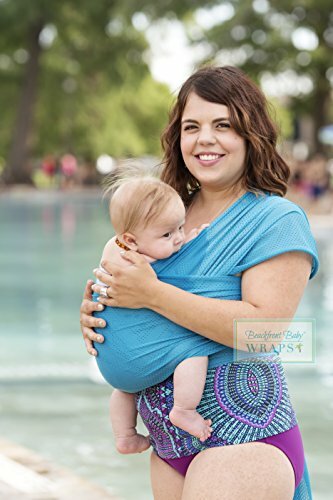 The Beachfront Baby Wrap was our top pick, and is a real convenience for your day out at the pool or beach so you can enjoy the sunshine with your little one!